Take a cyber journey through the world of science! Presenting more than 150 websites with primary source documents and authoritative data, this versatile book helps educators guide students on virtual scientific fieldtrips in all areas of science, from astronomy, biology, and chemistry to genetics, physics, and space science. Students can meet past and present scientists, follow along on scientific explorations, and learn about scientific conclusions and deductions. Each website listing includes a summary with historical background. Lively activities and questions are designed to motivate students to interact with the site, read and analyze the material, and draw their own conclusions. The questions and activities meet the standards set forth by the National Science Teachers Association and are designed to help students build critical thinking skills. Source material includes letters, journals, speeches, and papers. Related Web site suggestions, as well as appendices with additional science sites, periodicals, and organizations are also provided. 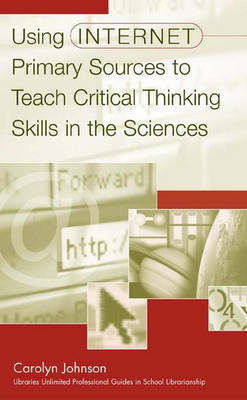 This latest addition to the highly acclaimed Libraries Unlimited Professional Guides in School Librarianship Series helps teachers and librarians enrich the science curriculum and foster critical thinking skills. Instead of relying on paraphrased information, students will learn firsthand about such topics as the Hippocratic oath and the Human Genome Project, making this an essential resource and lesson guide.